Myungsung is an interactive installation based on camera and processing. Web camera reads the color information of what audience wear and apply the calibrated color to Myunsung's garments on the screen. In the mid-19th century, Chosun (Korea) known as the Land of Hermits for her stubborn isolation from the western world, was about to be swept by the rising tide of global imperialism. As traditional feudal system began to collapse, tensions were brewing in all corners of her society and Chosun was no longer the Land of Morning Calm as its name implies. In 1864, a twelve-year-old nephew of the late king was put to the throne as king Kojong with his father, Taewongun, as the regent. In order to prevent future interventions by royal in-laws, Taewongun arranged a commoner, Ja-young Min, to be married to Kojong. An isolationist at heart, he vehemently adhered to close-door policy against Western Barbarians until 1873, when he was forced to retire as Kojong came of age. Chosun ended her seclusion by a commerce treaty with Japan in 1876 and opened doors to foreigners who came to seek immediate opportunities. Chosun was at the threshold of a new era with foreign ideas and cultures pouring in. Various modernization measures were introduced amid endless protests by conservative isolationists. Second commerce treaty was signed with the United States in 1882, and other western nations followed in quick succession. Meanwhile, reactions against modernization persisted and Queen Min was blamed as the harbinger of all intolerable reforms. Fuled by the Anti-Japanese sentiments which were grooming all over the nation against aggressive merchandising of Japanese products, army soldiers revolted in Seoul in 1882, killing Japanese and demanding execution of Queen Min. Taewongun converted the riot into a palace coup and Queen Min fled for her life. When China sent troops to crush the insurgents, Queen Min aligned herself with China and arranged Taewongun's exile. For the next decade China and Japan sparred against each over Chosun, which culminated into the Sino-Japanese War in 1894. Quickly overpowered, China had to yield all its vested rights in Chosun to Japan. However, Queen Min persuaded Russia, France and Germany to intervene, and Japan was left to lose its strategic bridgehead to China. Miura Goroh, new Japanese Minister Plenipotentiary in Seoul, plotted the assassination of Queen Min under the order of Japanese Prime Minister. At dawn of October 8 1895, in spite of fierce resistance rendered by Royal Guards, Queen Min met her fate by the swods of samurais. Chosun mourned in grief upon realizing who she really was and what she tried to achieve. Miura and his collaborators were recalled to Japan and faced a perfunctory trial. All were acquitted. For the next nine years, Chosun witnessed the tug of war between Japan and Russia. A decisive naval battle in Tsushima Strait brought Russia on its knees, and Chosun became a protectorate of Japan in 1905. Five years later, Chosun was annexed to Japan and remained as such until the Allied victory in 1945. 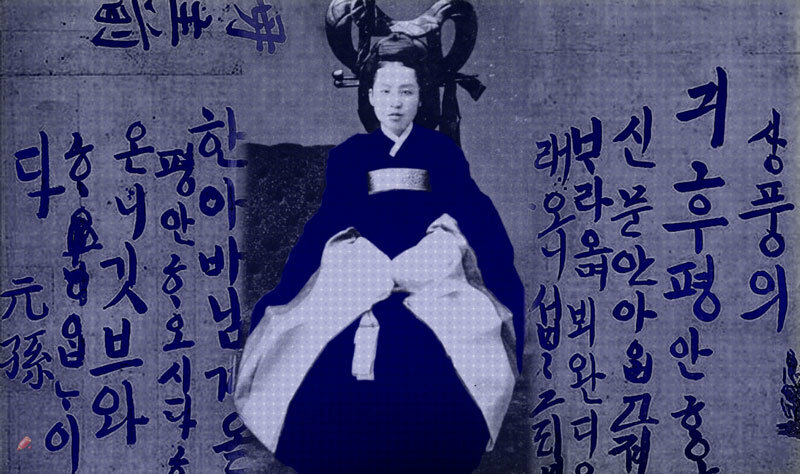 In 1897, Queen Min was posthumously endowed with the title of Empress Myungsung, when Chosun renamed itself as Taehan Jeguk, The empire of Great Han. It was the last gesture of defiance from the Land of Morning Calm.